We use the highest quality steel for a long-lasting, quality enclosed garage. Looking for the ultimate storage solution for your vehicle, lawnmower, bicycles, or other valuable items? Storing your items under the shelter of a garage helps to keep them in good working order saving you money in the long run. 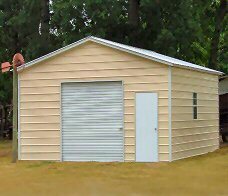 Our garages can be customized with various sizes, roof-styles and colors. Protect your vehicles from intense weather Whether you are looking for a storage solution for your vehicle or place to keep sports equipment safe and dry, a metal garage is the right solution for you. Our portable buildings can be designed to protect your cars, recreational vehicles or travel trailers from the sun, wind, rain and snow. 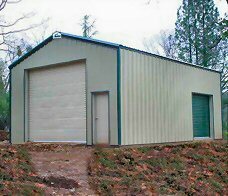 The length of your metal building is unlimited. And can easily be constructed to fit your needs. We want you to love your garage! You can customize the look and functionality of your new garage. We want you to find a style that will fit with your existing home or business. Your portable garage can also be customized to complement any existing structures, including your home. 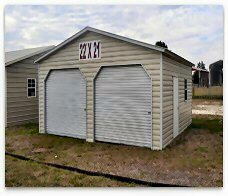 The industry standard length for metal garages is 21’, 26’, 31’, and up in 5’ increments. Garage height is measured by the side height, meaning the height on the sides of the metal structure, not from the very top point of the roof to the ground. IF YOU ARE LOOKING FOR A GARAGE, WE HAVE WHAT YOU NEED! WITH SIZES FROM 12’-40’ WIDE, ANY LENGTH AND HEIGHTS UP TO 20’. 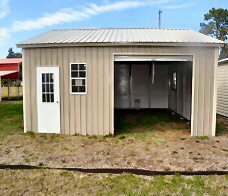 ALL OUR GARAGES ARE FLORIDA CERTIFIED, BUILT WITH 2.5” FRAMING & 29 GAUGE ROOF AND WALL PANELS. WE OFFER VERTICAL STYLE ROOFS & HORIZONTAL SIDING TO ENHANCE THE RESIDENTIAL APPEARANCE. WE CAN CUSTOM BUILD ANY GARAGE TO FIT YOUR NEEDS. - 10 YEAR WARRANTY ON STEEL SIDING - 12 MONTH WORKMANSHIP WARRANTY - 20 YEAR STEEL FRAMING WARRANTYHC Buildings warranties on our buildings ensure a long life on your portable building. 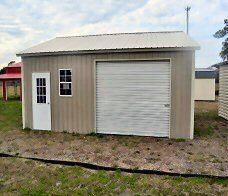 Garages - various sizes, roof-styles and colors. HC Buildings is your one stop shop for all your storage needs. We offer a wide variety of storage products including: portable sheds, carports, garages, barns and RV covers. All of our buildings are manufactured by Bennet Buildings Systems in the USA. We are proud to serve the Orange Park, Middleburg and West Jacksonville areas.